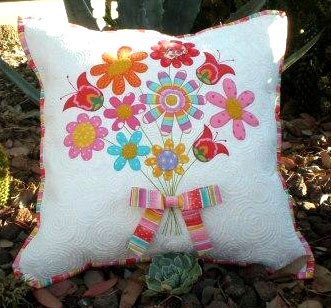 This pattern includes complete instructions, including a full sized pattern sheet, to create this delightful flowery cushion. The simplicity of the design and the size of the project makes it the perfect start for first timers wanting to try out raw edge applique & free motion quilting! The instructions include how to insert a zipper with a covering flap, a diagram of the background quilting, and lots of hints & tips to help you improve your raw edge applique & machine quilting techniques.